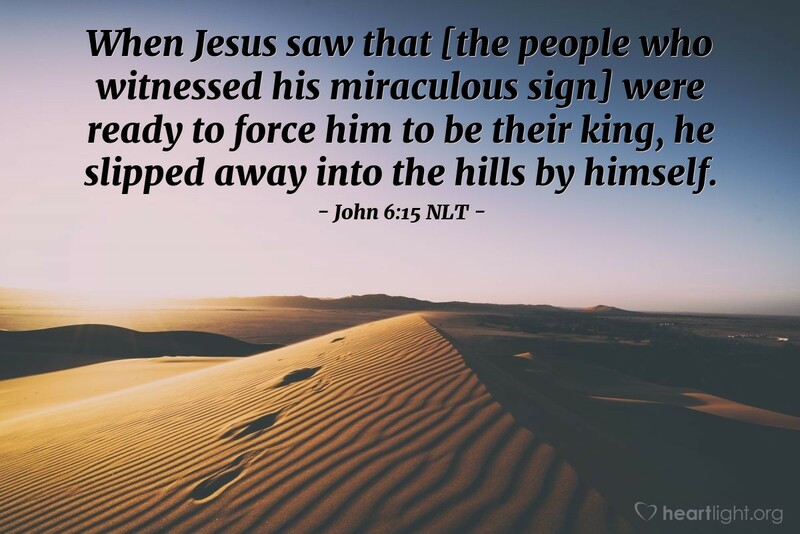 When Jesus saw that [the people who witnessed his miraculous sign] were ready to force him to be their king, he slipped away into the hills by himself. While tucked away in the middle of a busy couple of days in Jesus' ministry, this insight about what Jesus did is the crucial one in this chapter. Jesus was being tempted with fame and an earthly position of power. The temptation was a shortcut to glory among the people, but it didn't entail the cross. However, Jesus refused to be pushed and pressed into the crowd's mold (see Romans 12:2). Instead, Jesus was going to follow the Father's plan, not his own, and certainly not the crowd's selfish plan. He was going to do the Father's work and not be distracted by shortcuts or easy ways around the necessary. How did he stay on his course? He spent time with the Father, alone. He shut out the voices of the crowd and listened to the gentle tug of his Father's will on his heart. How are we going to stay on course in our walk with God? We're going to have to follow the example of Jesus. We're going to have to say "No!" to the shortcuts and spend time in the Father's presence letting him tune our hearts to his song of grace. Give me patience, O LORD, to wait on you and your timing. I confess that I sometimes take things into my own hands and forget to spend time with you discerning your will. Give me the courage and patience to do your will in your time no matter what those around me want me to do. In Jesus' name, I pray. Amen.